Mountain Biking La Sal Mountains The Whole Enchilada Trail. Moab Utah is iconic for mountain biking trails. There is no more iconic ride in Moab than the Whole Enchilada. The trails everything from singletrack to slickrock. The view are OUT OF THIS WORLD!!! If your riding ability is intermediate ability, you need to make the trip when you can. The whole Enchilada starts in the La Sal Mountains near Moab Utah. At first, the route is nice buff single track. As the trail drops down the mountain it turns to slick rock. The slick rock section is slightly technical and your concentration mustn't wander to the incredible views off Porcupine Rim. The beginning of the Whole Enchilada starts high up in the La Sal Mountains. 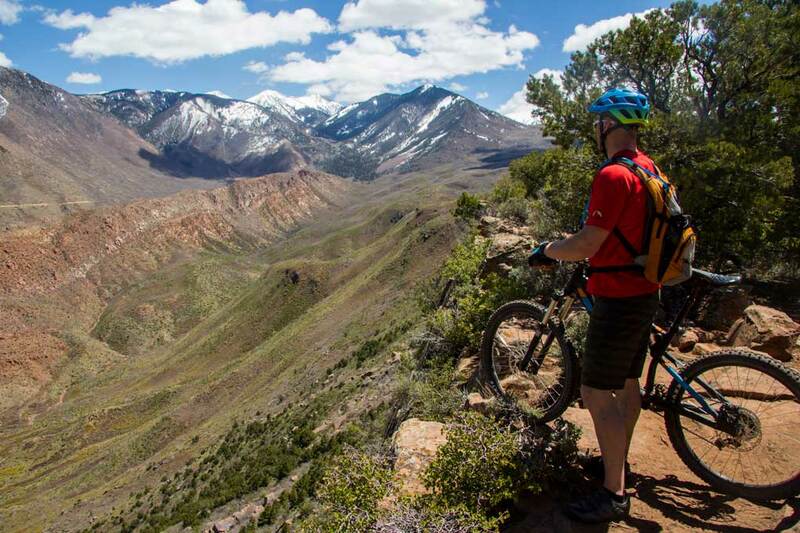 Enjoy the alpine scenery of the 2nd Highest mountains in Utah, as you wind your way down the buff singletrack. Next, get ready to have your jaw dropped looking off Porcupine Rim with views of Castleton Tower and the Castle Valley. This section of the trail is slightly technical and requires you focus; However, with views this Incredible it's hard to focus on the trail. Equally as amazing as the mountains and towers you'll pass along the ride, is the section of trail that runs aside the Colorado river. This section starts on top the cliff walls high up above the river. At the end of the trail you'll descend the final descent down to the river. The trail is over at this point, but the splendor continues. The Colorado River Path is stunning. It runs along the river back to the town of Moab. The canyon walls offer evening shade and the elevated path above the the river offers a safe and gorgeous route away from the highway traffic.